What Do You Call a Baby Goose? Gosling is a specialized term for a young baby goose, typically still covered with soft, fluffy down feathers and unable to fly. Because these chicks are precocial, however, even at a young age they can easily forage on their own and both walk and swim well. Despite the amount of independence they have immediately after hatching, however, goslings stay in a family flock under the protective eyes of their parents for several weeks or months as they grow and mature. 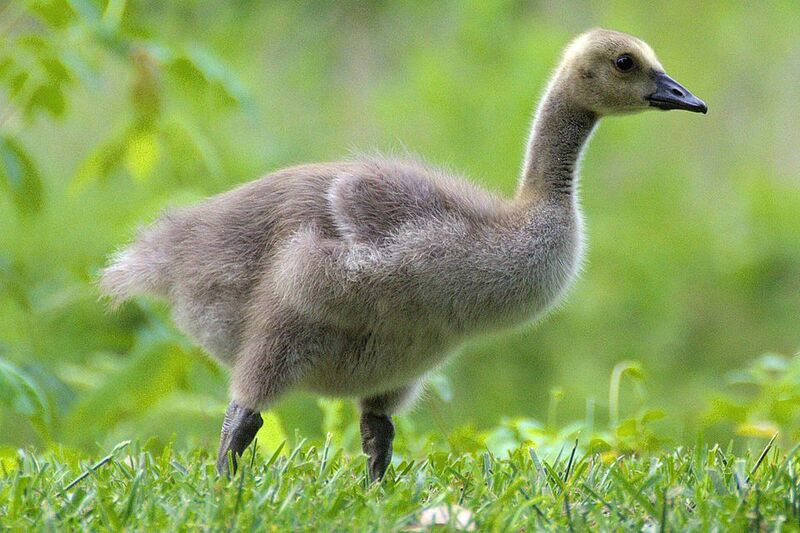 Both male and female goose chicks are goslings. The term is often only applied to the youngest chicks, however, and when juvenile geese begin to show flight feathers and adult plumage they are not typically called goslings. Some birders, however, do continue to call young geese goslings until they reach their full adult size, plumage, and sexual maturity. At what age young geese are called goslings or geese is largely a matter of personal preference and both terms are technically correct. Other birders prefer that older juvenile geese are identified by their individual species names, such as Canada goose, Ross's goose, cackling goose, greylag goose, and so on. Using species names ensures there is no confusion about the exact birds being referenced, even though species names do not distinguish birds' ages. It is important to note that not all "geese" are properly geese according to scientific classifications, and therefore not all babies of these species should be called goslings. Egyptian geese, for example, while they are commonly called geese, are actually ducks, and their young offspring would properly be called ducklings and not goslings. All young waterfowl can be challenging to identify because these birds are deliberately camouflaged for protection before they mature. Goslings can be distinguished from ducklings, however, based on their larger size and longer necks, as well as a more triangular bill shape. Ducklings, on the other hand, have more flattened, spatulate-shaped bills, are significantly smaller, and have shorter, more compact necks than baby geese. Range: Different geese often have different breeding ranges, and young goslings will not venture out of that breeding range until they have matured to their adult plumage. A camouflaged, hard-to-identify, immature gosling will not be seen extremely far from its mature breeding range. Markings: Despite their camouflaged, downy plumage, young geese often do have certain distinguishing markings, particularly around the head and face. Noting down color and the color of the feet and legs can also help identify young goslings. Voice: Young birds are often more vocal than their adult counterparts, and different begging calls can be distinctive. Furthermore, excessive begging will often call adults to return to nurture the goslings, providing the best possible identification clue, the parents. Other than rare instances where a duck or other waterfowl species has a common, colloquial name of goose, all species of goose have young called goslings. This includes the familiar Canada goose, bar-headed goose, magpie goose, red-breasted goose, and snow goose. Goslings are inexperienced and often clumsy birds, and their soft plumage, large eyes, undeveloped wings, and high-pitched squeaking calls make them endearing to birders and non-birders alike. It is important to note, however, that adult geese are extremely protective of their young and can become angry and aggressive to defend their goslings. It is best to avoid approaching goslings too closely, which could stress the young birds and aggravate the adults. Pets and small children should be kept away from waterfowl families, and not allowed to chase or stress the birds. Birders visiting local ponds should also avoid feeding goslings bread, which does not provide the proper nutrition for healthy growth and instead could create deformities that can handicap young geese. Goslings can be charming birds, and these young geese are often some of the first birds that urban or suburban birders may be able to see, particularly as chicks in local parks. Understanding the unique characteristics of goslings and how to properly identify them will help birders better appreciate all the life stages of these familiar birds. What Type of Duck is a Teal? What Makes a Duck a Drake?